View More In Luggage Locks. 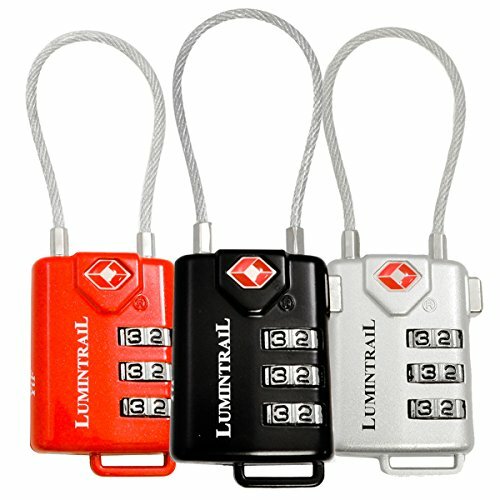 The Lumintrail 3 digit personalized combination cable TSA lock is the perfect solution for securing bags, zip pulls, suitcases, computer bags, and much more! The flexible cable allows for easy threading between zipper pulls or other small items you may want to lock together. With set-your-own combination convenience, you don't have to worry about losing the key while you travel. Also, the lock comes in three colors--black, red, and silver--for easy baggage identification. TSA approved! No need to have unlocked baggage while traveling anymore. The red-and-white Travel Sentry mark on the lock notifies screeners that they can unlock and relock your baggage without having to break the lock open. 4.5" long flexible cable makes it easy to secure your luggage and bags. No need to fumble with rigid shackles!